The common perception is that hybrids are complicated and expensive, cars reserved for the wealthy. But whether we like it or not, hybrids are a big part of the immediate future of automobiles. In that sense, Indian automobile manufacturers have a big task in their hands  convincing the average customer that a buying a hybrid doesn't mean he has to break the bank. Mahindra started it a few years back, with the Micro Hybrid system in the Scorpio which was essentially an engine start stop system. 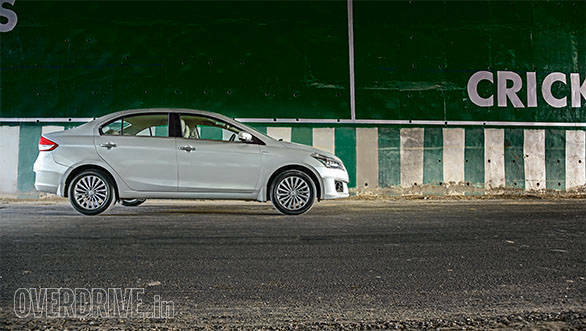 Maruti Suzuki has taken it a step ahead with the new Ciaz SHVS (that's Smart Hybrid Vehicle by Suzuki) which arrives less than a year after the original Ciaz was launched in India. It goes beyond Mahindra's micro hybrid territory into the mild hybrid zone where energy is stored and re-used when required, albeit on a small scale. You wouldn't know the difference from the outside, the only change being the new SHVS badge at the rear. The design otherwise continues to live in anonymity  it neither offends nor excites. 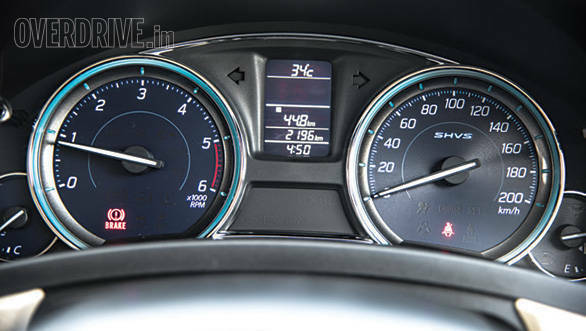 The same applies for the cabin  the sole change comes in a new instrument cluster that gets a blue tint around the dials and a gear shift indicator. 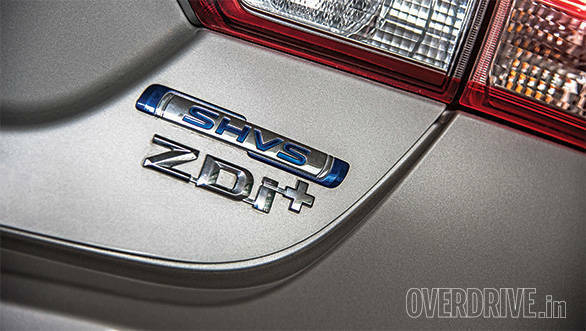 There's also an SHVS symbol that lights up when the system is activated and a button to turn off the start-stop system. So what is SHVS? In theory, it's quite simple  the standard alternator is replaced by an integrated starter generator. This is a device that helps the engine to quickly and smoothly start-up and shutdown while also allowing some energy regeneration when braking or coasting. That energy is stored in a new lead acid battery that has a special patented chemistry which allows for the high rates of charging and discharging the system boasts. Finally, under acceleration, the system supplements small amounts of power, although Maruti is clear that this is in the quest for better efficiency, not performance. Unlike more advanced systems like in Toyota's Camry Hybrid, there is no fully electric mode, the engine only turns off at a complete standstill. 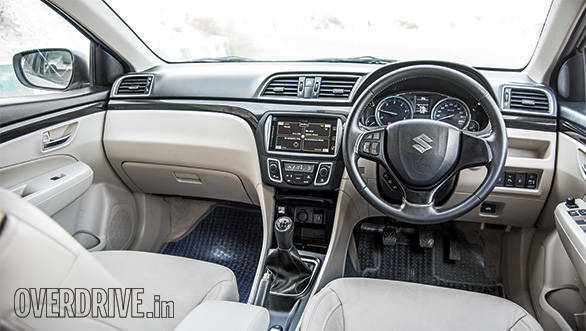 Pleasantly, the SHVS feels almost identical to a standard Ciaz, except for the fact that it automatically shuts down when you come to a standstill and shift into neutral. The engine restarts as soon as you get back on the clutch and the entire system is smooth and quick enough not to become a hindrance in traffic. It is a little more jerky on start-up than the expensive European cars that have this feature, but beyond that, I had no complaints. The aircon and audio system will work normally for a couple of minutes with the engine switched off. Once the battery can no longer provide enough power, the engine cranks back to life to keep the cabin cool. I felt no tangible difference in acceleration and the 12.9 second run to 100kmph is pretty much the expected result from a 90PS diesel sedan. But our efficiency test did produce some wallet friendly results  24.8kmpl on the highway and 17.9kmpl in the city, translating to an overall efficiency of 19.7kmpl. That's very impressive, but expectedly way off the unrealistic ARAI rated figure of 28.09kmpl. The SHVS system will produce the best results if you have a heavily trafficked daily commute with a lot of traffic signals where the start-stop system can do its thing. The simplicity of the SHVS system has benefits beyond just added efficiency. It requires no large changes on the assembly line and is considerably cheaper than the systems in cars like the Camry Hybrid. That allows costs to stay low and the Government's new FAME incentives make the SHVS slightly cheaper than the standard Ciaz diesel it replaces. The technology should percolate to other Maruti Suzuki diesel cars, making them both more desirable and affordable in the process. 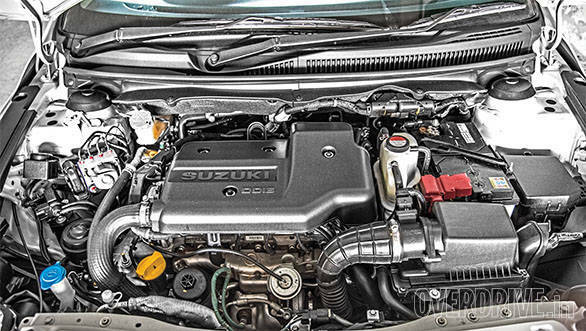 Maruti Suzuki diesels are about to get a whole lot more tempting.